A friend of mine, Wendy, has recently become VERY interested in learning all I know about preparing raw food. It all started a few months ago, when I asked her if she would be interested in some of the raw flax crackers and raw granola I'd made a few days previously. She tried them each right away, and went on and on about how amazing they were. "If I bring you the ingredients, can you make the crackers for me?" she asked with her mouth full. I assured her that I would, no problem. A few weeks later she called me and said, "I have the ingredients." So of course I made them for her, showing her how to do it at the same time, though at first I didn't know what she was talking about, since she didn't tell me why she was bringing ingredients over! On the Tuesday, I got a call from Wendy, saying "I have the ingredients, can you make the crackers for me? And can I contribute (aka help) to making them?" This time I knew what she was talking about, as it had been about 2 months since she got her one-month supply, so she was probably jonzing by then. In between cracker-making days, she's asked me many many questions about raw food; what do raw foodists eat (it's a common misconception that all they eat are salads and vegetables in stick-form), do they have to give up decadent desserts, are they all vegan, etc etc. I'm not a raw foodist myself, but I've done a lot of research on the subject over the past year, and of course have spend the past 2 June's mostly raw. As time went on and she learned more, her interest and excitement about raw food grew--to the point where she's now talking about getting a food dehydrator! 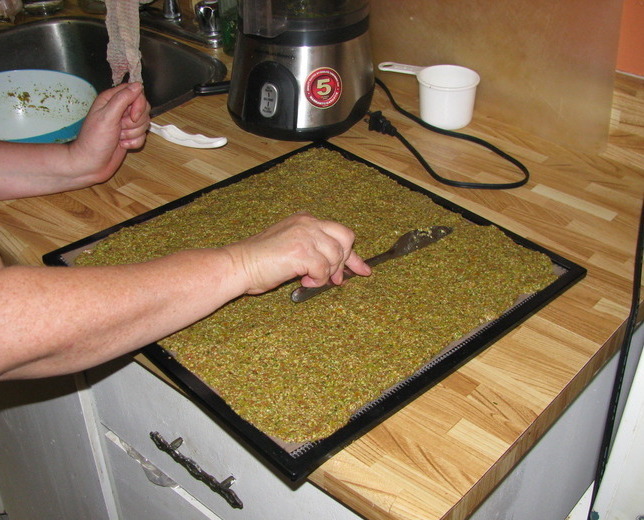 It's entirely possible that it's just because of her unholy love of raw flax crackers, but whatever--the uses for a dehydrator are myriad! 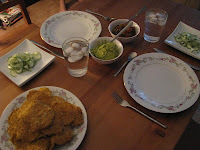 So, when she was all enthusiastic about making the crackers with me, and also that she could make the corn tortillas for with our dinner on Thursday (with my oversight of course lol--she could NOT follow the recipes, even though they had like one line of instructions...), I let her go crazy. And crazy she did. At one point I had to mention that it was easy to drive yourself nutty trying to make the crackers super level and smooth, because you just can't get it completely perfect. She looked up and answered, "Yeah, I can see how that might happen!" thinking it was pretty funny that it should happen to people...and then spent another at least five minutes going over the whole thing over and over and over... She looked at the tray on the level on the right...then the left, spin the tray and repeat! Eventually Wendy moved on to the corn tortillas, which are round...and which brought on a whole new psychosis!! HAHA! Anyway, two days later she came over for the Raw Dinner Extravaganza (ish lol). 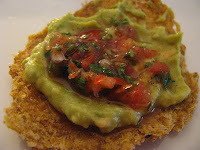 We used the tortillas to make mini tostadas--take one tortilla, pile on fresh guacamole, pile on fresh salsa, and eat! I'd made the tostadas before, so knew she would like them. 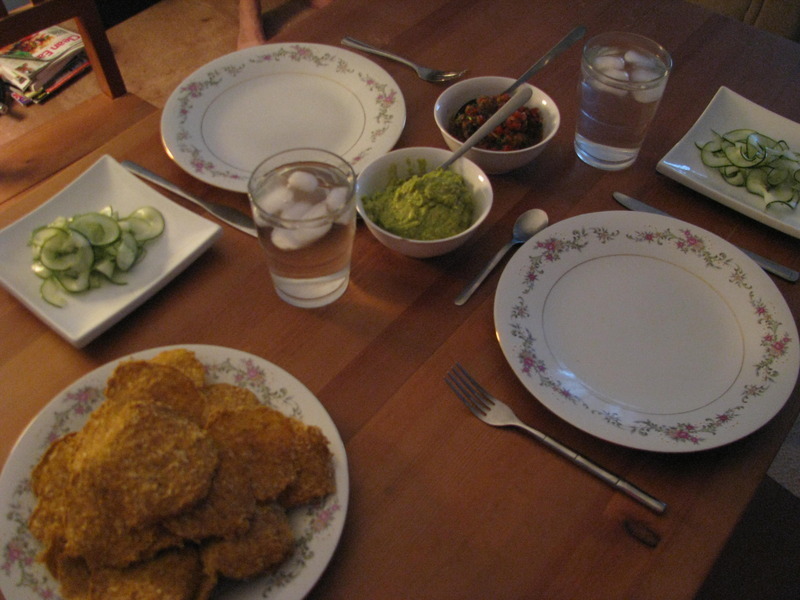 They're not very complicated--in fact the guacamole and salsa I made just before she arrived. I also made a side salad, which is pretty funny because all of it was plants! Anyway, you can see the salad on the little square plates in the picture above left. I used one of the blades I'd never used before on my spirulizer--the ribbon one. It was SO easy! For the dressing I mixed white vinegar, honey, and a tiny bit of sesame oil. I meant to toss it in raw sesame seeds too, but then forgot. Oh well, next time. It was a very good salad though! Wendy kept ooohing and aaaahing and twirling it on her fork and saying, "Look at how beautiful it is!" For dessert, I made something I'd never made before--raw lemon cheesecake with a crust and everything! I had a recipe, but I had to make a LOT less than the recipe called for--I didn't want 16 servings! So I just went by the ingredients, and eyeballed how much I'd need by volume to make 3 ramekins, and did it by taste. They turned out really well! They were very rich, and were probably twice the size they needed to be. Live and learn--get smaller ramekins! 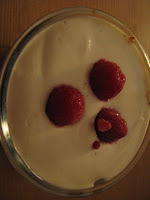 Or one of those cool mini cheesecake moulds with the bottoms that pop out. The cheesecake is on the right--for some reason it kept loading sideways! Throughout the whole meal, Wendy went on and on about how amazing the food was, which was really great. She even said that if she were to add raisins to the tortillas, she bet they would be as good as cookies. I hadn't thought of that, but I think with a bit of tweaking, she may just be right! It was very cool to show someone a whole new kind of eating that they'd never have tried otherwise. I'll have to do it again!